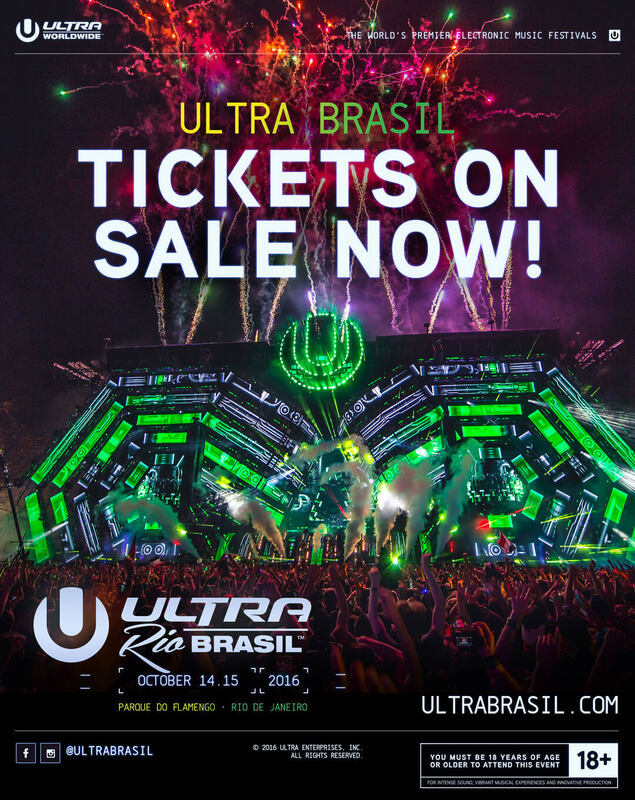 ULTRA Brasil Tickets are Back On Sale! Having SOLD OUT an exclusive pre-sale within a matter of hours back in April, ULTRA BRASIL today releases the next round of tickets for its hotly anticipated debut event in Rio de Janeiro later this year. Taking place on October 14 & 15, at the stunning waterside Flamengo Park, a limited number of GA and VIP tickets are now available exclusively from ultrabrasil.com. For international fans looking to experience this once-in-a-lifetime event, 2-day weekend tickets start at the incredible price of R$ 679 for GA and R$ 1,649 for VIP. Half price weekend tickets, available exclusively to Brazilian citizens*, start at R$ 339.50. Since ULTRA Worldwide announced plans to make Rio de Janeiro the nineteenth destination on its global tour in 2016, international demand for ULTRA Brasil has been unprecedented, with over 65,000 people registering their interest for the initial pre-sale. While registration is not necessary this time around, tickets will once again be allocated on a first come, first served basis and are in very limited supply. Landing shortly after the 2016 Summer Olympic Games at the beautiful Flamengo Park in Rio de Janeiro – a site that has been widely compared to Bayfront Park, the home of ULTRA Music Festival in Miami – ULTRA Brasil is well on its way to becoming one of the true highlights in ULTRA Worldwide’s ever growing stable of events. During ULTRA Miami, Martin Garrix and Carl Cox were announced as ULTRA Brasil headliners to millions tuned into the festival’s global live stream. The full Phase One lineup is expected to drop in the coming weeks. Stay tuned to ultrabrasil.com for the latest info.